She seems reluctant to unfold a plane, but when she looks back up at him, she sees a paper plane drop on his lap. The look on his face is inexplicable. “Someone thought of you,” she points out, feeling an ounce of hope for this man in front of her. QUESTION: In a few sentences, can you tell me about Paper Planes Back Home? Not including the book description… As in kunyari hindi ko pa siya nababasa, pano mo siya ipapaliwanag sakin? T: Okay, so, Paper Planes Back Home is an urban fantasy. Which has these two characters in a coma. And the way to get them to wake up, is for them to get these paper planes which are thoughts from their loved ones. So, we’re introduced to this place, that we don’t know where, but it’s kind of a limbo, where they’re standing on clouds. Those paper planes, when they get a lot of them they can build a bigger ride, and they can finally take the journey back home — which is synonymous to their families or their actual bodies… yung corporeal vessels! T: That’s basically the gist of the story, but there’s ano, a dash of romance lang. Here and there. Kasi one of the characters has a boyfriend. Tapos one of the characters has a girlfriend pero something wrong happened. Which explains why he’s not getting any paper planes. Basically that’s it, the journey of these two souls stuck in limbo and how they found their way back home. QUESTION: Where did the idea for the story come from? T: It came from this illustration I saw on Tumblr. 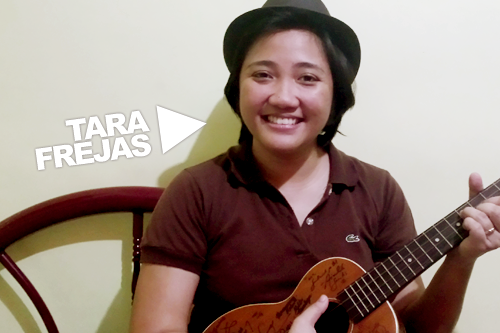 I can send it to you na lang. I saw it once, I saved it on my computer kasi it looked so pretty. It’s of a girl looking up and a lot of paper planes flying overhead. Pero yung surface na kinatatayuan niya isn’t land. It looked like… Di ko alam kung tubig o langit. A lot of Tumblr artists kasi that I follow medyo whimsical yung dating nung art nila. So that was one of the images that I saw. Nung nakita ko yun, sabi ko, oh my gosh ang ganda. Tapos ginawa kong wallpaper. T: I started to write something, a draft, May 2013. It started with, yun nga, the cloud scene. Dun lang, dun siya nagsimula. I kind of winged it also. Talagang kailangan ko lang siyang ikuwento. Hanggang sa umabot ako doon sa length na yon. But it took me about six months. QUESTION: Did the entire story go as planned? Or were there unexpected changes that happened? T: …wala kasi akong plano. [collective cackling] As in, seryoso! When I started the story I just wanted to tell the story of these two souls, and how they’re going to get back to their bodies. Pano ko sasabihin na there is hope for somebody else kahit… walang nagmamahal sa kanya. T: You know, nobody remembers him. So bakit walang nakakaalala sakanya? This other person, she’s well loved and a lot of people are encouraging her. 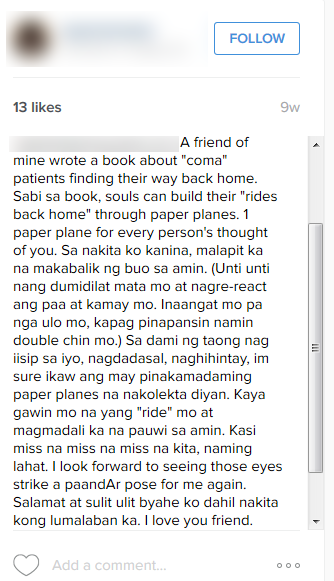 That’s what people say when someone’s in a coma diba? You talk. Because they can still hear you. But this other person, wala siyang nakukuha. So how? How does that work? Ang alam ko lang was how I wanted it to end. So yun lang yung goal ko, they started at this point, they will end at this point. T: Tapos dire-direcho na ako nagsulat without any outline at all. QUESTION: What is the best response that you’ve gotten so far about your story? T: The best response, so far… Ah. Teka lang naiiyak ako. C: Oh. Wait, I remember this story. T: Pero ayun nga for her to say na I want this story to come true for her friend, ayun. Yun yung best. QUESTION: What was the worst review, if there have been any? have to check my manuscript! Ayun, kasi it’s not a conscious thing unless someone points it out. So I got affected. Pero not in a bad way! Nung nabasa ko yung review, sabi ko: talaga?! Hindi naman siya worst, pero it’s one of the things na gusto kong balikan to correct. Tapos, siguro… ah! Kasi may comments ako na nakuha na sana Filipina na lang daw si Gianna. T: Kaso, well, the muse is Korean kasi. I couldn’t have written her as another nationality. Tapos yung trope pa na ginamit ko is very Koreanovela. So yung influence ko talaga lumabas. But, it’s okay. I wrote naman na a Filipina protagonist. In that other story na lang siguro. And so far yun lang naman pero hindi pa kasi tapos yung tour. [awkward laughter] Hindi ko pa alam kung ano pa yung iba kong makukuhang reviews. QUESTION: If you were Gianna, who is the person or people you would expect or want to get paper planes from? T: My family, siyempre. Una na yun. Kasi, parang, hello?? C: FAMILY SEND ME SOME PAPER PLANES! T: Pag hindi niyo ako pinadalhan parang jusko naman diba? Kawawa naman ako! Para saan pang may pinagsamahan tayo since birth! Pag di sila nagpadala, magmumulto ako! Yung ganon. T: Sino pa ba… my friends, siyempre. High school friends ko, kayo my Clingy Girls. Sana meron din akong Aaron. [laughter and lots of blushing] Kaso wala eh! C: Eh, dadating din yan. C: Si Radya papadalhan ka ng paper planes. 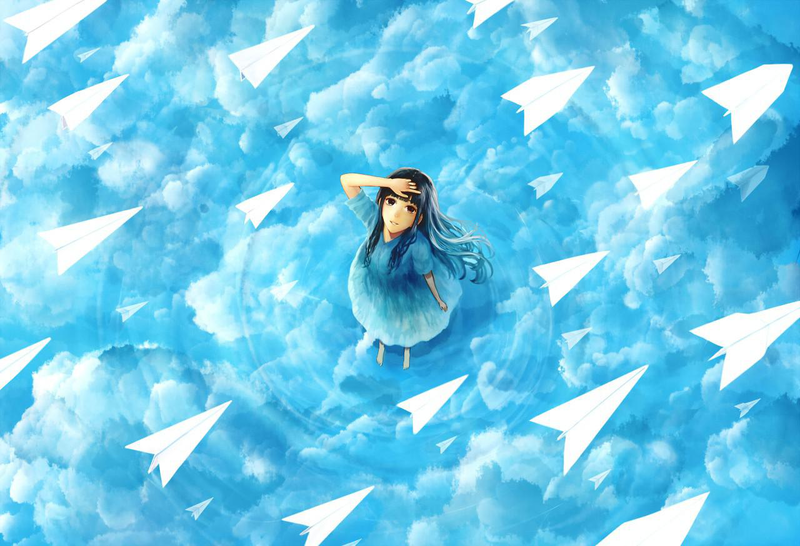 QUESTION: If you could send a paper plane to every person who needs one right now, what would be written on it? T: Well… there are people who need you down here. Please? I mean, it’s okay, pwede ka mag-limayon diyan for now. Kasi ang iniisip ko that place is also restful. It’s a place without disturbance. It’s a place where you realize how much love you really get. Magpalakas ka diyan, okay alng. But… come back. Come back here because there are people who need you, and love you. Yun. When the girl who likes to watch flowers bloom encounters the guy who's only in it while the fragrance lasts, curiosity gets the best of both of them. Find the beginning of this story in the #FatefulTurns Bundle, available on the BUQO app!